Table frontals were used on numerous types of Chinese tables: altar tables, dining tables, and magistrate’s desks. They covered the fronts, sides and legs of tables, and often coordinated with a set of matching chair covers. Such furnishings made furniture more flexible: the decoration could be adjusted for the season, the type of festivity, and the user’s rank. This frontal is tapestry woven in colored silk and gold threads, and edged with brocade trim embellished with Buddhist emblems. An overhanging top cotton cloth would have been used to secure it to the table. This frontal is heavily ornamented with imperial iconography. The lower section features imagery similar to that found on imperial dragon robes, with lishui waves and rocks and dragons highlighted in gold thread. The top section features roundels with dragons and phoenixes. In addition to these imperial symbols, the top section also includes two human figures associated with seasonal flowers, located on both sides of the dragon pair. The famous Tang poet Meng Haoran (ca. 689-740) appears on the right with a wooden staff and a servant boy in front of wintry plum blossom trees, the flower of the first month. On the left, the famous beauty Xi Shi (b. 506 bce) appears holding a white lotus branch, the flower of the sixth month. Rachel Silberstein is a historian of Chinese material culture, with a particular interest in fashion, dress, and textiles. She recently completed a D.Phil in Oriental Studies at the University of Oxford, in the Department of Oriental Studies. Her dissertation, Embroidered Figures: Commerce and Culture in the Nineteenth-Century Chinese Fashion System, explored how Chinese women’s dress was transformed by the commercialization of handicrafts and the popularization of dramatic culture during the mid-late Qing period. 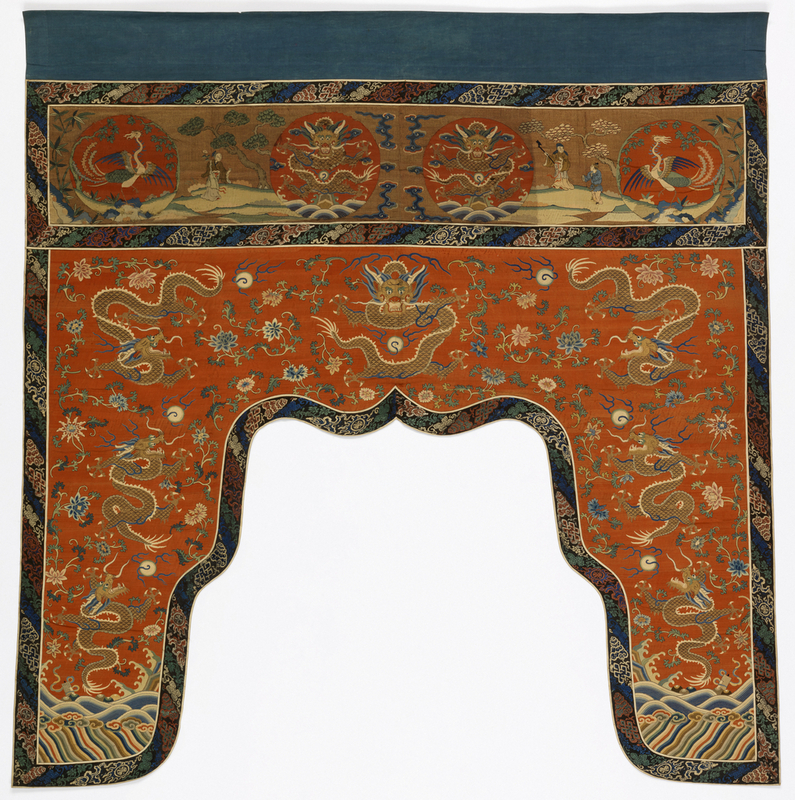 Table Frontal, China, 18th century, silk and metallic tapestry or kesi, Gift of Mrs. A. Philippe Von Hemert; 1958-69-1.